So you’ve been invited to a Jewish wedding but don’t know exactly what to expect? Here is a quick guide about what to do and how to act at the joyous occasion. Keep in mind that every Jewish wedding differs slightly from the next, depending on the religious and cultural background of the couple — and of course their personalities. The particulars of the guidelines below will vary depending on the celebration you attend. Like most weddings, the dress code for a Jewish wedding can be influenced by location and time of day. At many Jewish weddings, men wear kippot (skullcaps), and they will most likely be provided at the wedding. In some circles, you may see women wearing kippot too. Women at more traditional Jewish weddings wear skirts or dresses that fall below the knee and cover their shoulders — or elbows, in even more traditional circles. Sometimes women wear wraps or jackets that cover their shoulders just for the ceremony, and then they uncover for the party. You might have received an invitation with two different start times. The first time listed refers to the start of the kabbalat panim — the time for greeting the couple before the ceremony — and the second time refers to the actual start time of the ceremony. Though it is nice for close friends and family to arrive at the beginning of the kabbalat panim, you can consider all of the kabbalat panim as an appropriate window for showing up. If there is only one start time listed, that is probably when the ceremony is scheduled to begin, so be on time. The kabbalat panim prepares the couple for the wedding, and a lot of different things might take place there. At a more traditional kabbalat panim, the bride and groom sit in different rooms or areas, and guests greet them and often enjoy some light — or not so light — refreshments. Some brides and grooms fast on their wedding day until after the ceremony. It’s completely fine to eat in front of them at the kabbalat panim, but you may want to think twice before offering them refreshments. At a traditional kabbalat panim, the bride often sits on a special seat, and guests approach her to give good wishes. She may offer a special blessing in return. The groom might have a tisch, where he sits around a table with his family and friends singing songs. He may also share words of Torah. The guests often heckle him by shouting and singing to interrupt him, and you can join in the fun. The bride may have her own tisch as well. During the kabbalat panim, some couples read a document called tenaim, which outlines the conditions of the marriage and declares the couple’s intention to wed. This is followed by the breaking of a plate, usually by the mothers of the bride and groom. Symbolically it reflects that a broken engagement cannot be mended. The ketubah — the Jewish marriage document — is normally signed at this time. In more traditional circles, it is signed at the groom’s tisch. 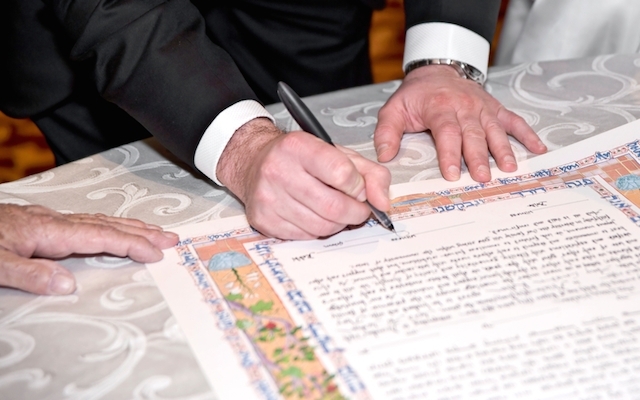 In more liberal circles, the ketubah signing may be the main event of the kabbalat panim, with the couple, witnesses, and all the guests present. After all the legalities are taken care of, the groom is escorted by his friends and family, usually with dancing and singing, to meet the bride and veil her in a ceremony known as the bedeken. 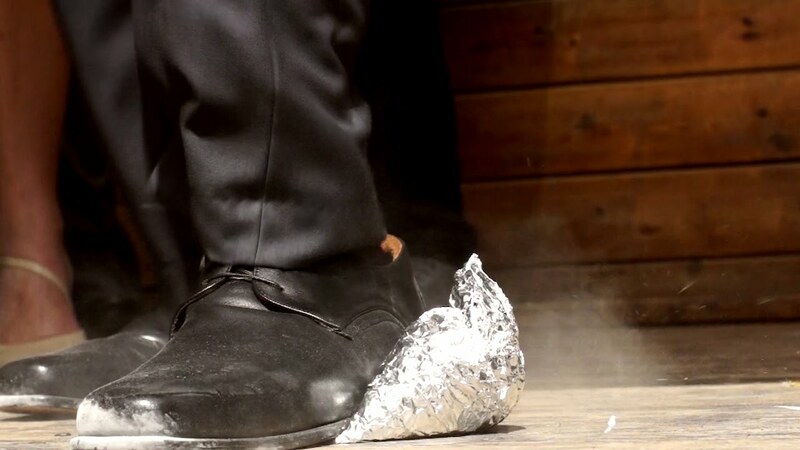 This is often a particularly moving moment of the wedding, so if you’re planning to come late and skip the kabbalat panim, try to come at least 15 minutes before the ceremony is scheduled. In a wedding with only one start time, the ketubah signing and veiling are usually taken care of with the rabbi in private, before the ceremony begins. Jewish weddings do not usually follow the custom of having the bride’s and groom’s guests sit separately, but at some Orthodox weddings, men and women sit on opposite sides of the aisle. As you enter the room for the ceremony, look out for a program that explains what’s going on. Not all weddings have these, but they are becoming increasingly popular. A rabbi or cantor usually conducts the ceremony, standing under the chuppah (marriage canopy) with the bride, groom, and sometimes their families and friends. In the middle of the ceremony, the ketubah may be read by a rabbi or friend. The ketubah is often a beautiful piece of art, and after the ceremony you may be able to admire it if it is on display. Near the end of the ceremony, the sheva berakhot — seven blessings — are recited over a cup of wine. These may be recited by one person, often the rabbi, or by several people. the bride and groom wish to honor. The guests in the crowd may sing along during the sheva berakhot. Feel free to hum along even if you do not know the words. After the conclusion of the ceremony, at more traditional weddings, the couple heads directly to a private room to spend their first few minutes of marriage alone. In this case, there will not be a typical receiving line. If the cocktail hour didn’t already happen during the kabbalat panim, guests are invited for cocktails and hors d’oeuvres. Be careful not to fill up. Even at the most elaborate spreads, there will most likely be a full meal served during the reception. After the meal, more traditional weddings end with the recitation of a special grace after meals, which includes a recitation of the same sheva brachot recited during the ceremony. Guests are seated and join together for this. Many couples produce benschers (grace after meals booklets) with their names and the date of the wedding printed on them. You can take one of these home as a party favor. Of course, there is great variation in Jewish weddings, so it is always good to check with your hosts prior to the wedding if you have any questions.